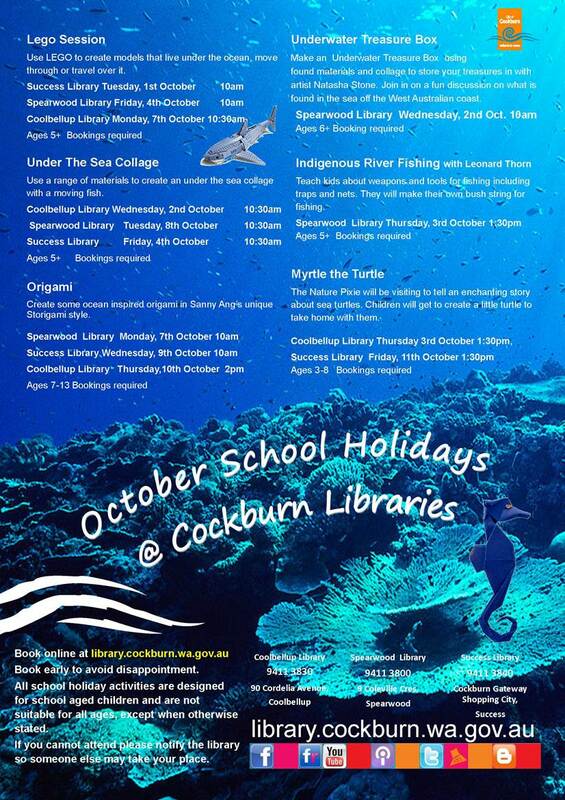 Home » Latest News For Adults » School Holidays @ Coolbellup Library. Have you booked yet? School Holidays @ Coolbellup Library. Have you booked yet? Use a range of materials to create an under the sea collage with a moving fish. Ages 5+. Bookings essential. The Nature Pixie will be visiting to tell an enchanting story about sea turtles. Children will get to create a little turtle to take home with them. Ages 3-8. Bookings required. Use LEGO to create models that live under the ocean, move through or travel over it. Ages 5+. Bookins essential. Create some ocean inspired origami in Sanny Ang’s unique Storigami styles. Ages 7-13. Bookings required. PreviousSchool holidays @ Success Library. Have you booked yet? NextFremantle Dockers answer "What is the best book you have read?"